Hello love bugs! Happy Happy Wednesday:) I hope everyone has had a great week so far! I know its been a busy one for me and I am feeling so blessed. Its also officially spring, so that is wonderful news..it has been in the 70's here the last two days and I am loving every minute of it. I have a feeling we have not seen the last of the cold front though but who knows these days with the weather. iThis little dress is my absolute favorite item from Luna Grace Boutique. It is so girly and I love the length. The bows are just darling and it would be such a great spring or summer piece to have in your wardrobe.. I cant wait to break it out again and again :) Even better is that it is only $29!!! I hope everyone has a great Wednesday! On another note this top is one I have been craving for so long! It comes in so many different colors, like 20 (maybe not that many but you get the idea) but I NEEDED the blush, haha. Luckily I was in Belk yesterday and it happened to be on major sale, it was the last one, I just knew it was fate! 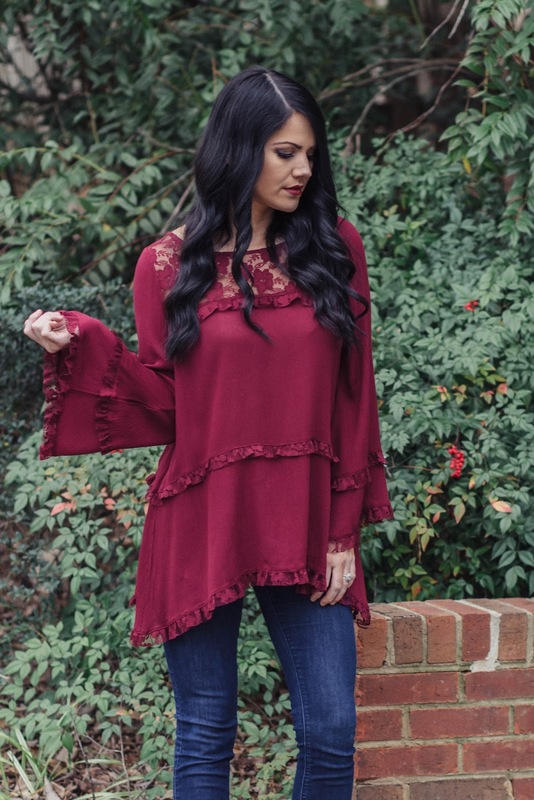 It is so comfy and oversized and you can wear it off the shoulder like I do or the regular way. It can go from fall to spring effortlessly. I am sure I will be breaking it out in the next few months with shorts, when we have cooler days! If you haven't snagged it yet, you must! Unfortunately most places are sold out of the blush color. But have no fear, you have 20 other colors to choose from! Hello Hello, Happy Friday my dear friends! I am so thankful it is Friday.. this week has been a long one for me.. I have been battling a migraine on and off all week and I am finally starting to feel like a normal person again, thank goodness!! In other news it has been freaking bitter cold here all week, it snowed a few times and when I say "snowed" I mean, it was small flurries and melted the next day. In my opinion this takes all the fun away from snow.. what happened to snow days and all that goodness?! I do feel terrible for all the stuff happening in the north with the snow storm and I am thinking and praying for all those people! 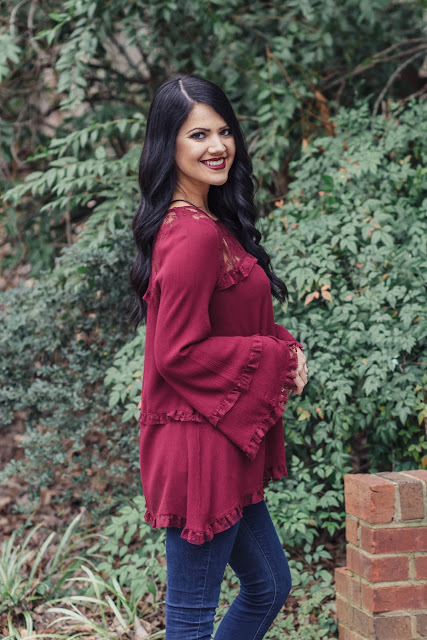 I decided to post about this fun burgundy bell sleeve top today because it is still cold and in my opinion no where close to spring! Just didn't feel right to post about a sundress just yet, haha! Anyway, this top is so fun and flowy and I want to wear it all the time. 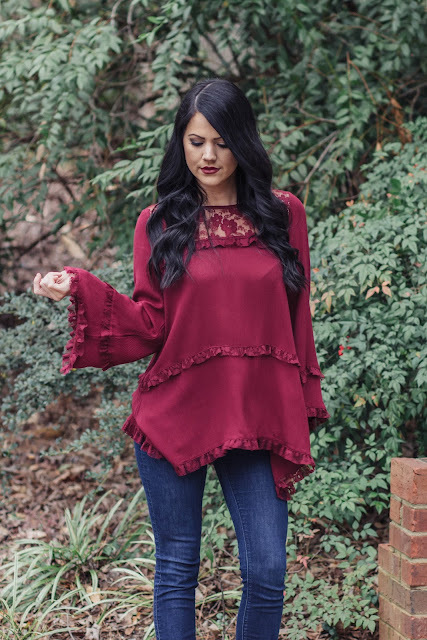 If you follow me you know I have a small obsession with bell sleeve tops. I must confess I went to Loft one day and bought FOUR..yes you saw that correct, four..I have issues, haha:) I plan on breaking this top out again for a date night with some leggings and booties, it is just too cute! I hope you all have had a great week and are ready for an even better weekend! Anyway, lets just chat about this adorable little maxi romper, I am OBSESSED! It is the perfect spring dress and can be worn with heels and a hat to dress it up or with a cute pair of sandals to dress it down! I am a crazy hat lady right now and wanting to purchase them all when I find ones I love. 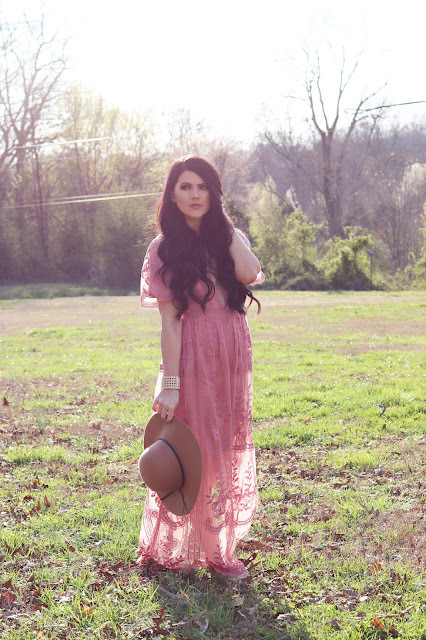 This Old Navy hat ended up pairing perfectly with the maxi. 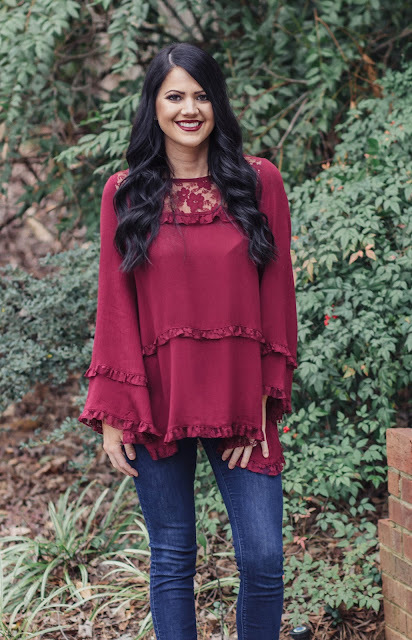 Can we also talk about the color, it is my absolute favorite for spring... its a good alternative to the blush that I am usually obsessed with but this in my opinion is WAY better. 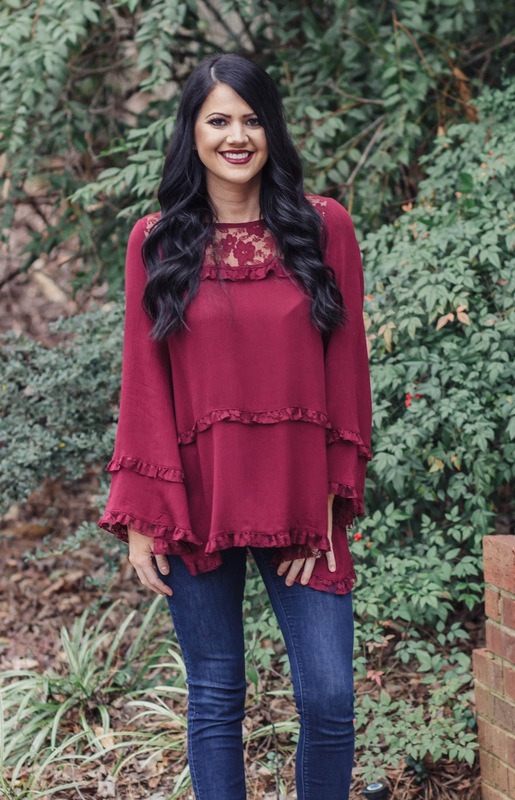 This beauty if from The Mint Julep Boutique.. they have the cutest items on there site, and a ton of wonderful spring dresses that I currently have my eye on! 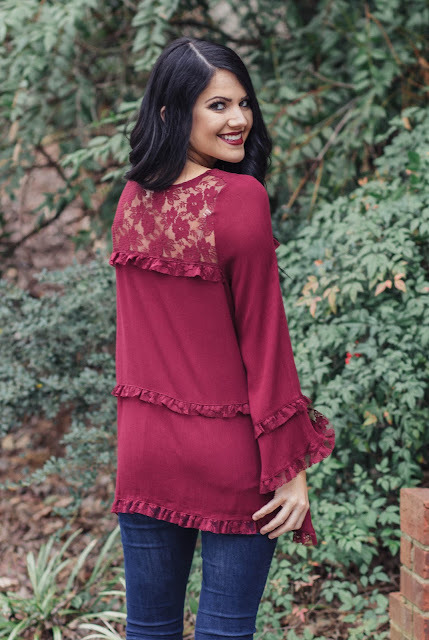 Also just another perk is that they are super affordable, which I am always happy to find because it is much easier to update a wardrobe with all your spring favorites when you can great quality products for a great price! If you haven't checked them out yet, here is your chance :) If you sign up for their emails you can also get $10 off your first order! So even more incentive to go out and do alittle shopping! I hope everyone has a great day and even better rest of your week!